El Dorado County is renown for it's wide diversity of award winning wines that are vibrantly flavored, delicious, and grown in the high elevations of the Sierra Foothills! You will not believe the breath taking views of the fine wineries backdropped with the Sierra snow caps. The Historic old cellars and million dollar tasting rooms are magnificent. The beautiful gold country tangled with apple orchards and grape vines are a picture waiting to be taken. No matter what you're tasting style, El Dorado County Wineries will fulfill your desire! El Dorado County's wine industry was born when James Marshall started the Gold Rush on the South Fork American River in 1848. By 1870 El Dorado County became the third largest wine producer in California. Sadly, shortly after the poor economic conditions, diminishing local population, and the prohibition, the El Dorado County wine industry virtually disappeared. In the late 1960's El Dorado County winemaking started its comeback following several experimental vineyards that proved the area was perfectly suited for high quality, dry table wines due to the climate and soil of the region. Today El Dorado County boasts of over 2,000 acres of vines and over 50 wineries creating some of California's finest wines! This is a one of a kind wine tasting experience that you won't want to miss! 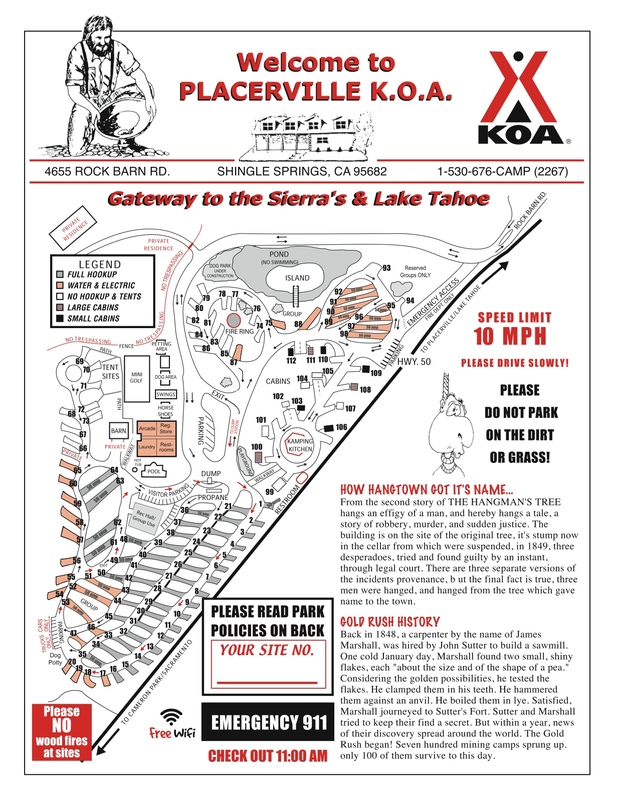 Placerville KOA offers the best lodging to really set the theme to your El Dorado County wine tasting tour! Come settle in to one of our cozy old fashioned camping cabins or bring your RV and take advantage of our resort styled accommodations! Our KOA has hosted thousands of guests and large groups to get the most out of their El Dorado County wine tasting tours. Our camp-store features a fine selection of wines from Latcham & Granite Springs Vineyards to wet your appetite or bring home souvenirs. The campground is located only minutes away from all the El Dorado County winery favorites! Click here to visit the El Dorado Winery Association for winery listings, maps, and more!